CAMBRIDGE, MA – A month has passed since the majority of Colombians voted ‘No’ in a national plebiscite on the peace agreement that the Colombian government had signed with the Revolutionary Armed Forces of Colombia (FARC) in Cartagena (50.21% -6.43 million votes- to 49,78% -6.38 million votes-). That night, President Juan Manuel Santos addressed the country on TV accepting the defeat, reaffirming the ceasefire and calling for national unity. Timochenko, the FARC’s No. 1, seconded him by reiterating his will for peace. Alvaro Uribe—a former Colombian president and the leader of the country’s political opposition—also issued a statement in which he advocated for a great national pact and invited the Government to review the current accords. In the subsequent weeks, the whole country entered in a period of high uncertainty, while many people reacted with great emotion. Student organizations around the country took the streets in massive marches and public events claiming for peace*, while the Government and political leaders who campaigned against the agreements began internal negotiations in order to build a national dialogue for unity. In spite of the profound polarization, Colombians received a reassuring message from their political authorities, who in the midst of the crisis seemed to prefer the extension of peace talks with FARC instead of supporting a military solution. Though both the government and the opposition agree that there is a need for peace, they disagree on what is the best way to reach a better agreement for all parties involved. The reasons for their disagreement are the constitutional character of the accords, the extent of the collaboration with the FARC in the fight against drug trafficking, the mechanisms to repair the harm of victims, and the transitional justice system. The opposition is concerned that the accords reach a legal status that is as significant as constitutional law. They also demand the FARC members to fully commit in providing information to counter drug trafficking, and to fund the victims’ reparation initiative with their own money. Moreover, they insist to completely modify the Special Jurisdiction for Peace—an innovative justice model that would determine how former FARC members will be judged for their crimes—which they perceive as a source of impunity. Although the Government doesn’t disagree with such claims, the real question is whether or not the FARC rebels are able to accept such demands and sign a new agreement. Last week, during a colloquium organized by the Colombian Caucus at the Kennedy School, a group of 24 students from Colombia and other countries of the Americas had the opportunity to talk with Mr. Carlos Holmes Trujillo, the former Director of the ‘No Campaign’ and a prospective presidential candidate from the Democratic Center Party–funded by Alvaro Uribe. The event namely “Colombia’s Peace Agreement: What’s next?” created a space for pedagogical, spontaneous and constructive exchange between one political leader who opposed the agreements, and students who want to positively contribute to the discussion about the peace process with FARC. Mr. Holmes, who was appointed as a delegate from his party to participate in the negotiations between the opposition and the government, asserted during his conversation with the students that negotiating a better agreement was a historic and unequivocal opportunity for the country and that Colombians can’t afford to miss it. He didn’t hesitate to recognize that The Nobel Peace Prize awarded to President Santos ought to be seen as a call for greatness and responsibility. Although, all the audience shared his aspiration of constructing a more inclusive and complete agreement, it also expressed concern regarding its timeline and the risk of failing for trying to reach perfection. The picture is quite complex and it is not likely that we will reach a new final agreement in the short run. However, several governments had shared statements of support, while students had exerted pressure requesting the negotiating parties to reach an agreement promptly. Both messages pointed in the direction of reconciliation, supporting the idea that peace is still possible. The majority of society—including those who voted against—still believe that the dark days of war will remain in history. Nevertheless, the reality is that the nation is in the hands of political leaders. The future of the whole country has been reduced to what President Santos, President Uribe and Timochenko decide to do in the weeks and months to come. It is a moment of greatness and leadership, in which we expect from them the necessary wisdom to separate personal egos from political ambitions in order to privilege the stability of a nation. Now that the Plebiscite is done and negotiations have resumed in Havana, it is time for unity and hard work. In other words, it is time for politics. 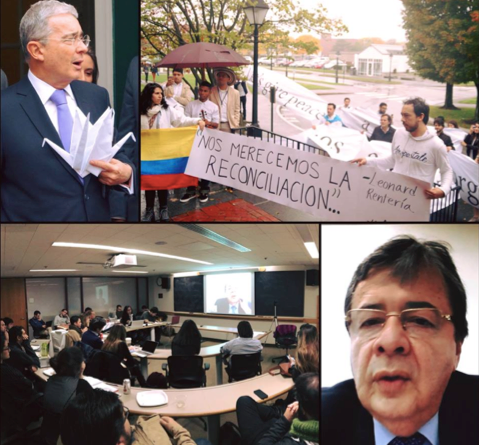 *Colombian students in the Boston area showed their support to the Student Movement in Colombia during President Uribe’s participation in the HBS Latin American Conference. During a symbolic act in front of the school, the students showed him banners with messages like ‘Give peace a chance’, ‘We deserve reconciliation” and “We are confronted with the fierce urgency of now” (Martin Luther King). They also gave him An Open Letter for Peace containing proposals on how to move forward in the peace talks. President Uribe invited them to a small meeting with him to discuss those issues and share his insights on the subject. The author would like to thank Ms. Andreina Seijas for her collaboration on editing this article and Ms. Johanna Lopez for her advice. Manuel is currently a 1st year MPA student at the Harvard Kennedy School of Government and an editor of the LAPJ. Prior to joining HKS, he worked as a research fellow at the Labor Markets Division of the Inter-American Development Bank (IDB) in Washington DC, where he led the construction of an online platform on labor and pensions indicators -namely The SIMS-. Before that, he worked in two different United Nations’ agencies (UNESCO and ILO) supporting the organization of global forums for youth, such as the UNESCO Youth Forum in Paris (2011) and the ILO Youth Employment Forum in Geneva (2012). He is interested in topics related to innovation, city management and urban development. He is also a soccer fan of Millonarios FC and a cheeseburger lover. Manuel holds a B.A. in Finance and International Relations from Externado de Colombia University and completed an international exchange program at SciencesPo School of Public Affairs in Paris.